As noted by Elizabeth Bugental, it is a pretty good bet that our old age will last at least as long as our adolescence. While most of us didn't plan out our life path during adolescence, if we are lucky we might have an opportunity to do so in old age. The question is do we have the courage to examine our fears, desires and motives and determine how we would like to live the last decades of our life. Through partnerships with writers such as Elizabeth Bugental and Gloria Steinem, Eldership Academy Press seeks to encourage us to approach the process of aging with consciousness and to direct our thinking toward the possibilities ahead. edited by Nader R. Shabahangi, Ph.D.
by Nader R. Shabahangi, Ph.D.
Why are We So Afraid of Alzheimer's Disease? by Nader Robert Shabahangi, Ph.D.
by Riki Intner, M.A. and Roberta Cole, M.A. "Julia is weaving the thread of personal development, emotional intelligence and whole system thinking into her creation of a new approach to care systems, where we learn how partnership, empowerment and awareness of rank and privilege create wisdom and eldership for the community of caregivers and people requiring support. A refreshing and thought-provoking must-read if you or your friends or a family member is in a care environment, if you work in one, or really anybody who is interested in making care more humane, less custodial and more fun for everyone involved". ~ Drs. Max and Ellen Schupbach, founders of the Deep Democracy Institute International. 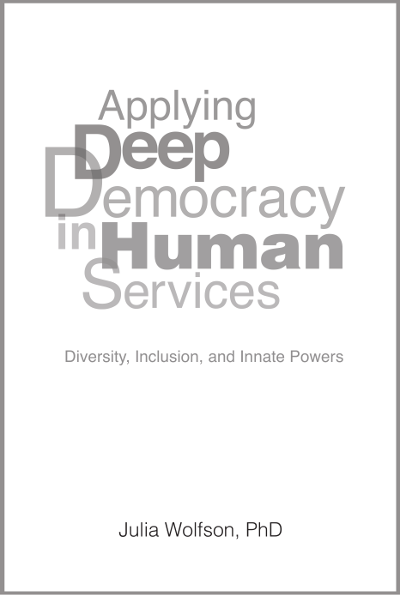 "Dr. Wolfson's book Applying Deep Democracy in Human Services shows how certain skills and metaskills using 'deep democracy', can help those in need, caregivers and whole organizations thrive!" ~ Drs. Arnold and Amy Mindell, founders of Process Work, deep democracy and worldwork. ""This is an important text for the future. On a global scale we are discovering that relationships and connections with other people, opportunities, and resources provide the best guarantee of health, safety, and growth and development. We are also discovering that we can no longer afford to continually enlarge the disability bubble. We will need to master the material that Wolfson provides us if we intend to explore sustainable lives and relationships beyond that bubble". " ~ James F. Gardner, PhD, President, J Gardner & Associates, LLC, and Past President and CEO, Council on Quality and Leadership, 1989–2012, Sarasota, Florida. "Finally, after working for over 40 years with people with challenging behaviors, predominantly in the field of Intellectual Disability, I am awed and heartened by this book. Rich with insight derived through direct practice and capable of being extrapolated to all nature of oppression and abuse of power, Dr. Julia Wolfson uses her own rich life and work experiences to expose the painful abuses and misguided power-over in interpersonal relationships that often commingles with well-meaning care-taking intentions for people with different abilities. Through her powerful storytelling she simultaneously exposes us to pain and suffering, as well as the hopefulness of the healing path when truth is heard in a facilitated environment. This book is very important for us all to read, especially if we hope to help humanity develop to its fullest potential. I will assign it to my students in our MSW program as well as to our clinic interns as a strategic guide to transformative leadership, and recommend it to everyone I come upon who is trying to help change the world". ~ Dr. Beth Barol, Associate Dean and Director of Social Work, Widener University, Pennsylvania, USA. "For more than a decade the author has worked with our organisation in a village in Africa, for children, youth and young adults with different abilities, bringing us together to discover at progressively deeper levels what the core of our work is. In this book she shares the treasures and insight of many decades of work supporting organisations to bring out the strengths of vulnerable people. It is a remarkable book that should be required reading for all who work in this field". ~ Agas Groth, CEO Camphill Communities, Botswana. "This masterpiece promises to make a significant contribution to the most difficult existential questions of our time. In a fascinating weave of experiences from her professional life and deep, personal accounts, Julia provides a roadmap for a journey of a universal kind. The inquiry is both confronting and comforting. The authenticity of the voice in this narrative demands of us as readers that we, too, ask ourselves: how can I be safe and free? What does it mean to be alive? Can I become an agent of change? Can I grow my own power or must I wait for this to be authorised by another? This book should be on any reading list that aims to educate people within the social sciences. It applies not only to the education and care sectors but in any context within which our aim is to serve others. With its refined approach to inclusion, this book applies to any culture or nation where there are individuals who put their work in service of their fellow human beings. Courage and love in equal measures has made this book what it is. Read it and be changed." ~ Charlotte von Bülow, founder and CEO, Crossfields Institute, Awarding Organisation for specialist qualifications, Stroud, United Kingdom. "Bringing in her personal and professional experiences with people of diverse ages, backgrounds, abilities, sexual orientations, political and spiritual beliefs, Julia discusses 'nine innate deep powers,' giving concrete examples in her work and suggesting 'on-the-spot practices' that can be used to apply these powers. As a counselor, multi-cultural educator, and mother/grandmother of a family with varying abilities, I identify with and will continue to learn from Julia and the people and situations that she describes". ~ Dr. Sally Gelardin, AgeSong Community Engagement Director, San Francisco, USA. Encounters of the Real Kind are exactly that: deep, life-changing meetings between human beings. Edited by Nader Shabahangi, Ph.D.
Elders Academy Press is excited to present the third volume in the Encounters of the Real Kind series; a shared tome of stories, poems and musings from the 2013/2014 participants in the Pacific Institute Gero-Wellness Program at AgeSong. The Gero-Wellness Program interns at AgeSong come from a variety of schools and universities in the San Francisco Bay Area and beyond. The participants are interns and doctoral students with backgrounds in psychology, gerontology, counseling, grief and loss support, and human development. Through their practicum experience at AgeSong, they show an authentic interest and passion in their work with the aging population. The Pacific InstituteGero-Wellness Program interns are part of an engaged movement that views aging with respect and awareness. All residents at AgeSong Communities have an opportunity to connect with interns who provide emotional and therapeutic support individually and/or in group settings. Interns spend two or more days a week in an AgeSong community and may accompany residents to group programs, share stories while on walks, connect in a painting class, listen to music, and read poetry together. They also plan trips to the opera or share in a quiet moment. Groups focus on meditation, expressive arts, movement, humor, national and international news, literature, travel and much more. Our interns follow the lead of elders; they show us what is important to them. AgeSong programming for eldercare seeks to return meaning to aging and "Old Age." In so doing, the hope is to return to the centrality of meaning in all of our lives. Meaning is not to be found in either the pure philosophical contemplation of life or just the practical, everyday activities of earning a living. Rather, meaning must be grounded both in concepts and in experience. What makes the Gero-Wellness Program so unique is that students who are learning about the social sciences, such as social work and psychology, can combine these intellectual concepts with the depth of experience presented to them by elders. Residential care settings such as AgeSong provide such opportunities. In these stories and poems you can see how the AgeSong Elders are teaching the timeless qualities of being human: being in the moment, in the here and now, relating deeply with others and oneself, being kind and generous, giving and accepting, loving and caring. These ways of being are so very much needed in our modern-day societies, which are increasingly fast paced, materialistic, and cerebral. Elders show us what our heart needs, what it yearns for. As such, elders may be the solution to many of the problems we face today. All we need to do is listen, to spend time with them. Our lives may never be the same after such encounters of the real kind. Days spent as an intern at AgeSong are unpredictable. Any given day may hold moments of joy, connection, challenge, affection, sadness, and delight — often in rapid succession. The experience of being there is collage-like, with many elements co-occurring simultaneously. My arts background gives me the freedom to look at things through my own lens, paralleling the creative freedom memory loss can give some of our forgetful elders. The collages reproduced in this book are visual anecdotes created to process my experience of a day's worth of encounters with members of the AgeSong community." ~ Ivy Tiegel, MFTi Expressive Arts Therapy Intern. "So how can we come to understand and cherish, accept and love our frail and forgetful seniors? The answer: by appreciating who they are right now—not compared to days, weeks, or years ago. We need to meet and appreciate them as they are today and not worry about yesterday or what will happen tomorrow. We can deal with that as it comes. Most importantly, we need to celebrate who they are now, accept their limitations, and rejoice in what they still have—what Age Song calls "personhood." As the educational component of the AgeSong/Pacific Institute collaborative, Pacific Institute actively promotes the recognition of "personhood," making the experience for residents of AgeSong-managed facilities full and enjoyable. Furthermore, Pacific Institute seeks to spread this philosophy of care to all who desire to connect more intimately with seniors. That philosophy is reflected in these stories, poems, and observations, contributed by our interns. Enjoy them!" Suffering holds one of the deeper meanings of life: the ability to connect with your soul, your deep humanity. This connection with suffering pushes us to become ever more aware. Rather than trying to eliminate suffering, we can celebrate it as an opportunity to deepen who we are. This book is my effort to re-introduce a love of philosophy to psychology. As Suzuki Roshi states, we're beginning to look again at the world from a place of not knowing rather than knowing — a world full of possibility and probability, as opposed to fact and clarity. "A clarion call for those of us privileged to call ourselves awareness workers, psychologists, counselors, social workers, process workers and psychiatrists alike. Nader Shabahangi's words invite us into a challenging dialogue with Freud and Heidegger, two thinkers whose ideas forever changed our way of understanding the inner and outer world. Above all, Ambiguity of Suffering alarms us to awaken from the prevailing narrative of positivism, and to enter a world rich with ambiguity, mystery, and meaning." "In this inspired re-contextualization of psychological epistemology, Dr. Shabahangi problematizes the very grounds upon which mechanistic influences of human behavior are predicated. Categorical diagnoses of the many forms of human suffering reflect an effort to eradicate pathological mental conditions, and yet, as Dr. Shabahangi demonstrates, the experience of making meaning as a human in the world compels suffering — just as the ambiguity of suffering, and all that accompanies its existential significance, nourishes the meaningfulness of being. From the orientation of Heidegerrian philosophy, Ambiguity outlines historical and present-day mechanistic conceptualizations of the human experience, problematizes a reductive understanding of the human mind and spirit, and advocates for a more holistic conceptualization and treatment of the "problem" of psychopathology." This is the second volume in the series of Encounters of the Real Kind. These stories, poems and musings are shared by the 2012/2013 participants in the AgeSong Gero-Wellness training program. The Gero-Wellness Internship program emphasizes that we need to 'see' and care for the whole human being, that we learn from our elders about what really matters in life. With backgrounds in psychology, gerontology, counseling, grief and loss support, and human development, interns come from a variety of schools and universities in the San Francisco Bay Area and beyond. These interns show an authentic interest and passion in their work with the aging population. They are part of a movement that views aging with respect and awareness, a necessity to become a mature and wise human being. This is a view that looks at the gifts aging afford us. Pacific Institute teaches a humanistic-existential, process-oriented approach to working with individuals in general and elders specifically. This approach refrains from pathologizing and labeling and tries to understand the appearance of symptoms as important messages to be explored and understood. In such a phenomenological approach, symptoms are understood as solutions to whatever ails or burdens a resident rather than a problem to be eliminated. All residents at AgeSong Communities have an opportunity to connect with interns who provide emotional and therapeutic support individually and/or in group settings. An elder once told me "We will all die. Why? Because we can't take care of each other." I have seen amazing transformation of GeroWellness interns over the past year. When they started AgeSong's Gerowellness Program, interns thought they were helping members of the community. Upon completion of the program, they came to the realization that they were learning more from members of the community than members of the community were learning from them. The stories in Encounters of the Real Kind (Book 2) document their learning. "I bring the wood and the AgeSong Elders start the fire with their wisdom." Tom Greening is a wonderful role model of an elder, poet, philosopher and educator who shares personal, honest and lyrical contemplations on later life issues. The poems in this collection grew out of his serving as a training director at Agesong, his psychotherapy practice, and his own aging. He and his dachshund are gradually getting used to being "elders." Tom Greening studied at Yale University, the University of Vienna, and the University of Michigan. He has been a psychotherapist in private practice in the same office since 1958, and was Editor of the Journal of Humanistic Psychology for thirty years. His poems have been published in many places including The American Scholar, Los Angeles Times, and The Lyric, and translated into six languages. Collections of his poems include Tolstoy's Lament and Words Against the Void, both available in Russian translation. He also published Nasreddin the Psychologist, a collection of stories about a famous Persian fool whom he turned into a modern psychotherapist. Book One, edited by Nader R. Shabahangi, Ph.D. The AgeSong Institute Gero-Wellness training emphasizes that we need to 'see' and care for the whole human being. It teaches that symptoms are meaningful and important signals for a deeper understanding of each person, that these symptoms need to be met with curiosity and respect, with an attitude of wonder and love. There is never anything 'wrong' with a person. Rather, we ask: what is right about what is happening now? Where does it want to lead us? How are we to understand its message to us? We see our elders with eyes of love, not with eyes that look for pathologies and disease. Elders, with all of their richness, depth and life-experience, are the most beautiful teachers in this world. These teachers provide our interns – but really all of us who take time to be with them – the privilege to deeply experience and understand what it means to live a life, to have lived a life. Elders give those who will allow themselves to be present with them an exceptional opportunity to grow into a full human being. This is not an easy journey. Interns face the complexity of the question of human identity and the fear and anxiety of disability and dying. They begin to understand the difference between being-with and doing-to and learn the art of unfolding a person's process. They experience the many forms of forgetfulness and states of awareness, the many ways of communication, verbal and non-verbal. They begin to appreciate the quality and subjective nature of time, of slowing down, of being present and of listening deeply. They learn to establish a trusting relationship and experience the richness and challenge of hospice work. They learn about mindfulness, about focused attention, building community, and the meaning of isolation and loneliness. They learn to be with coma, trauma, and the many other forms and meanings of dependencies. They learn about the finitude of life, about what really matters – to them and others. Interns begin to grasp the difference between information and knowledge, between knowledge and wisdom. Hearing an elder speak about life, sitting quietly next to a forgetful elder holding hands, walking slowly with an elder noticing one's breath, the breeze on one's face - these are encounters of the real kind. They present us with an inkling of the dimension of the human soul and spirit. These encounters change your life. Elders remind us of the big questions of life: what really matters to me? What gives me a true sense of contentment, of feeling useful inside? What are the moments I cherish and how do I remember those as guideposts for living my life? How do my actions, thoughts, and behaviors further who I would like to become? What is the vision I have of myself, of the society within which I live, to which I would like to contribute? What are the values I hold dear and for which I want to stand? What would I like to leave behind when I part from this world? These questions are central, I believe, to living a life that is worth living. It is in joining with the elders of today that each one of us can be enriched and deepened, that our culture and societies can be reminded of what makes us essentially human. Elders Today poses these complex, quintessential questions, helping us not only learn to appreciate what it means to be an elder; we can't help but actually look forward to becoming elders ourselves. Gems of Wisdom is a celebration of eldership and the wisdom that accompanies life experiences. Elders throughout California submitted prose and poetry to inspire readers to reflect and embrace their own creativity. A portion of the proceeds from Gems of Wisdom will help AgeSong Institute fund its Expressive Arts Programs throughout the Bay Area. The goal of the Expressive Arts Programs is to combine creative expressions such as writing, painting, arts and crafts, dance, music, and sculpture with psychotherapy and life coaching. "The anthology by AgeSong abounds with playful poems of times well lived! It's a fine thing to read the poem stories that sing of love songs along with hardship from people who are now in their seventies and eighties, even nineties. The humor will delight you. You may wonder what you'll be saying at that age!!" How can we not be afraid of Alzheimer's Disease? How can we not dread aging? By posing these questions we are invited alternate ways of seeing Alzheimer's disease as well as aging. In so doing we do not want to minimize the suffering that people may experience watching a loved one become forgetful. Nor do we want to minimize that becoming forgetful and growing old can be pain processes. Rather, Conversations with Ed wants to create a positive cultural space for people with dementia, for those who accompany them on their journey and for those who fear being afflicted with it. Love Fills In the Blanks is an insightful heart-opening book that examines paradoxes of aging as they form from the direct experience of the author, Elizabeth Bugental, and of many of her students, each of whom is more than seventy years of age. For Elizabeth, many things became apparent during the writing of this book. One is that we live in contradictions and paradoxes with the main ones being that as we grow old, we are more conscious of living than we are of dying and of finding than we are of losing. So it is natural that this book forms itself around paradoxes. In the pages within seven paradoxes are emphasized, although there could be hundreds. The book suggests that the right conditions for seeing and embracing the exquisite beauty that life offers us while at the same time experiencing difficulties that life presents us are all present once we approach old age consciously although at times it is difficult to stay aware of the possible hidden in the seemingly impossible. The reality is that when we care for an ailing partner or adult child, contend with our own aches and pains, face unwanted surgeries, lose a spouse or sibling or friend, we get a rough shove into awareness. But with or without that shove, losses slowly mount and force us to wake up and deal with the inevitable. The paradoxes in this experience are a daunting and beautiful learning. As Elizabeth says, "I find myself seeing them everywhere now and I find that comforting. No need to decide, but to just acknowledge both sides of the seeming contradictions, and to live enjoyably with one in each hand for better balance and perspective." by Nader Robert Shabahangi, Ph.D. & Bogna Szymkiewicz, Ph.D.
We apologize that we are temporarily sold out of the softcover of Deeper into the Soul. We expect to have it back in stock in April. In Deeper into the Soul: Beyond Dementia and Alzheimer's Toward Forgetfulness Care, the authors invite us to shift our attitude toward dementia, or forgetfulness, as they call it. Accompanying us are four characters—a sage, a psychologist, a physician, and an intern—who each sees Forgetfulness from a different viewpoint. The goal is to develop a perspective which includes the basic ingredients of openness, curiosity and acceptance. Deeper into the Soul reminds us that each stage of forgetfulness is a meaningful part of the life journey, during which people have important emotional and spiritual experiences. The authors remind us that with each effort to understand others, we expand our view of the world. Rather than simply a disease, forgetfulness has purpose and meaning; rather than simply being in need of our care, people with forgetfulness can teach us about life and living; rather than a burden, people with dementia offer us an opportunity to slow down, to be more open and caring, to get in touch with the essence of our human nature. In the process, we deepen ourselves, deepen our souls. This book is a practical guide for people who work and live with relatives or residents with symptoms of forgetfulness. The authors offer ideas and tips dealing with symptoms such as aggression and wandering, but they also explore a new way of understanding the people for whom we care. They ask the basic existential questions: What are the possible meanings of forgetfulness? What purpose does it serve for both caregiver and the one experiencing forgetfulness? "Deeper into the Soul is a beacon of hope and understanding for victims of dementia, their caregivers and families. This remarkable book presents a comprehensive explanation of the challenges of life with Alzheimer's, and encourages us regarding its possibilities for the future." "In times when our society faces an increasing number of people suffering from dementia, an approach that goes beyond the neurological explanations and adventures into the emotional and spiritual experiences of those suffering and those caregiving brings a perspective that encourages support, understanding, and a very much needed new paradigm to face this challenge. Deeper into the Soul represents that paradigm in which dementia and forgetfulness represent a meaningful part of the life journey." "If you are a researcher, a hospital worker, a teacher, a caregiver, this book belongs on your desk or at your bedside. ... Deeper into the Soul will push you further than you meant to go, surprising you into a smile of pleasure, a buzz of new learning, a challenge to your usual interpretation of meaning. Best of all, it will engage and enlarge your heart." — Elizabeth Bugental, PhD; Psychotherapist and Author of AgeSong: Mediations for Our Later Years. Gloria Steinem became a spokesperson for issues about aging quite accidentally after declaring to a reporter on the occasion of her fortieth birthday, "This is what forty looks like. We've been lying for so long, who would know?" Because of this casual comment about her age and about the collective societal pressure to lie about our age she received an avalanche of thanks and support from other women facing age discrimination. This caused her to realize the far reaching dimensions of age oppression. In her inspiring essay, Doing Sixty and Seventy, Steinem shares her views on age stereotyping, the unexpected liberation that comes with growing older, and defines what she perceives as the fact that women become more radical as they age. The essay also sheds light on the forces that shaped her life and for readers who have only heard bits and pieces about her the essay offers a primer on her bold and logical theories. In the essay, Steinem describes turning fifty as "leaving a much-loved and familiar country" and turning sixty "as arriving at the border of a new one" in which she looked forward to "trading moderation for excess, defiance for openness, and planning for the unknown." In the Preface — written when Steinem is just past seventy and twelve years after the essay was first published — Steinem explains the development of her precious sense of mortality and time. Elders Academy Press is proud to publish Ms. Steinem's enlightening and thought-provoking essay — thus allowing it to appear for the first time as an independent volume. Gloria Steinem remains the United States' most influential, eloquent and revered feminist more than three decades after founding Ms. magazine. A devoted activist and writer, Steinem continues, as she has for more than thirty-five years, to travel nationally and internationally and speak with a calm voice of reason and articulation about gender, racial, and other civil inequity issues. In Caregiving from the Heart: Tales of Inspiration, Roberta Cole and Riki Intner take readers on what can be a life-altering odyssey of connection and caring. At a time in our history when our population is living longer and longer, caregiving has become a national health issue as well as one of the greatest human challenges of our time. How do we respect, honor and attend to the needs of our elders? As well, how do we respect, honor and attend the needs of those facing life threatening health issues earlier in life. How do we reconcile the seemingly huge gap between our own needs and theirs? And most of all, how do we create and sustain a dialogue that is meaningful for both? Woven throughout Caregiving from the Heart: Tales of inspiration are the threads of true experience. We hear from children, friends, relatives and partners, long distance caregivers and many recipients of care. The shared stories help us to navigate the maze of emotion that can be at once tearful and ebullient, gut wrenching and heartwarming. The stories cover moments large and small and often address elder issues of pressing concern - from painful role reversal, driving, safety and depression to loss of mobility and even to last chance romance. We learn that there is no right way to care and that caregiving opens windows on the full range of possibility available to us when we participate in one of the most profound adventures of our lives. The stories speak of agony and surprise - of joy and despair - but most of all - of discovery. Caregiving from the Heart: Tales of Inspiration is like having a support group in your own home. Keep it on your nightstand and use it whenever you have the need. Growing old is not an option. But how we age is a choice. At least we like to think so. AgeSong gives us a pleasurable nudge and a little inspiration to take charge of our aging. None of us knows how many years this final life-phase will last, but it's a pretty good bet that it will last at least as long as our adolescence. If we can remember back that far, unlike this life-phase, those teens and early twenties seemed to go on forever and we sure didn't have a plan. Now we're old enough and maybe even wise enough to decide how we'd like to live before we die. And maybe we even have the guts to make the choices we need to make to do it in style. The style, of course, needs to be our own, not one planned out for us by society, our children, our peers, or even our personal habitual mind-sets. We're finally old enough to consult our deeper selves and do it our way. AgeSong can be taken in small doses to direct our thinking toward the possibilities ahead of us rather than the life we've left behind. It offers us a look into a world that, for many of us, has always been available, but which we may not have had the physical or mental luxury of enjoying. It provides us a simple, yet profound, breathing space to take in the richness within our reach that could fill our last days with wonder and gratitude. Elizabeth Bugental spent her 20s and 30s as a Catholic nun in Los Angeles. She has taught on all levels and was, for over a decade, Chairperson of the Department of Theatre Arts at Immaculate Heart College in Los Angeles. Her second career, lasting into her sixties, was as a psychotherapist in the San Francisco Bay Area, in private practice and working jointly with her husband of thirty-six years, James Bugental, noted Psychologist and author. She holds a doctorate in Speech and Drama from Stanford University, a Masters Degree from Catholic University of America and is a licensed Marriage and Family Therapist. Faces of Aging is a collection of essays and photographic images that address the challenge of aging in a society that is not sympathetic to older people. The result of this negativity deprives us all from interaction with a very valuable segment of the population. Older people can provide us with experience, knowledge and affection if we change our attitude toward them and begin to see them as a resource rather than a liability. History and the humanistic tradition have shown us that when respected and valued, older citizens can continue to be productive and creative and can contribute to the quality of life. Faces of Aging is a tribute to elders and is dedicated to removing the veil from the subject of aging. The book invites us to ask how we can remain conscious of the ways in which we impose our own fears of aging, of death, of the changes that invariably occur as we age, onto the elderly themselves: If we ask ourselves to face our own fears of aging and dying, maybe we can begin to understand how these fears express themselves in our work with and attitudes toward the elderly. How, in our interactions with the elderly, can we remain open to what they have to offer us, not only because they have more life experience than we do, but also because they are entrusted in our care? How does our contact with the elderly inform our awareness of our own inner elders? How is the whole topic of the elderly important to those of us in the younger generations? Why do we age and what for? Of what are we afraid when we think about aging? How did it happen that we humans came to treat today's elderly in such a disrespectful fashion? How would we like to be seen when we are old? This book is an invitation to look at aging and old age differently, to question our common cultural and personal assumptions about aging and old age. The writing, photos and poems presented will invite the reader to meet with the many images of aging and look anew for meaning in aging and old age, for the maturity and wisdom the Old Wise Guide, inside of us all, offers us. Nader R. Shabahangi, Ph.D., received his doctorate from Stanford University and is a licensed psychotherapist. His multicultural background has made him an advocate for different marginalized groups of society throughout his adult life. In the 1980's he worked with abused children and teenagers and led anticipatory bereavement groups for Coming Home Hospice. In 1992 he founded the non-profit organization Pacific Institute with the purpose of training psychotherapists in a multicultural, humanistic approach to counseling and to provide affordable therapy services to the many diverse groups living in San Francisco. The Therapies of Literature are richer and deeper, more moving, more human than anything we have yet called psychology. Using names of schools of psychology, Jungian, Bio-energetic, Existential, merely gives a frame to the possible discussions, a place to start. How many fictions are about human loneliness, human courage - the aspects of our lives of major concern to all therapists. How many ways can we as readers know more about all the others, the unseen companions of our frantic or bored hours, know their fortitude, even in those ultimate moments: a child is born, a beloved person dies. What else does literature have but this - the many guises of one life.